Having discussed the Capture, View, Measure, and Math sections of the table in previous installments of this series of posts, it's time to turn our attention to the Analysis portion of the tool set. The Analysis tools comprise by far the largest section of the Periodic Table. You can glean a great deal of insight into a waveform simply by viewing the signal, taking measurements, and applying math functions. However, it's the oscilloscope's analysis tools that make quick work of digging up anomalies, scrutinizing jitter characteristics, and investigating the relationships between analog, digital, and serial-data signals (Figure 1). A Pass/Fail mask compares an acquired waveform to a "golden standard" waveform. Pass/Fail testing can be done using a pre-defined mask or a mask created from your actual waveform, with vertical and horizontal tolerances that you define. Various Actions can be defined for the oscilloscope to perform based upon the result of a Pass/Fail mask comparison. One may define multiple Pass/Fail queries whose complex result may define a set of Actions. Actions include Save, Stop Acquisition, Alarm, Output a Pulse, Save a Hardcopy, or (create a) LabNotebook. Boolean Compare: Only Teledyne LeCroy oscilloscopes permit powerful pass/fail conditional setup on measurement parameters. 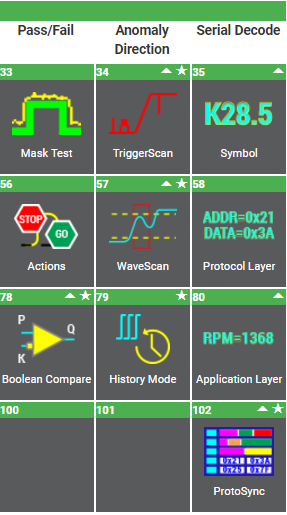 Combined with All Instance, Parameter Acceptance, and Measure Gate, you can configure just about any pass/fail condition you will need using more than 200 different measurement parameters, or those created using Parameter Math; or Custom Measure with automatic notification or action enabled using Actions. Parameter comparisons can be made using a variety of operators, such as >, ≥, =, <, ≤, ∆, or ∆%, with ∆ results compared to current mean value, mean value ± 1σ, or mean ± 3σ. Powerful Boolean conditions can be configured with up to eight different pass/fail conditions (queries), using combinations of ALL TRUE, ALL FALSE, and various AND/OR conditions. TriggerScan teams high-speed hardware triggering capability with a persistence display mode to capture only the signals of interest. Traditional fast display update modes work best on frequent events occurring on slow edge rates, while TriggerScan excels in finding infrequent events on fast edge rates. Because hardware triggering is used to capture only the elusive events, TriggerScan is more effective at quickly finding anomalies compared to simple display technologies. A built-in automated Trigger Trainer analyzes the waveforms, identifies normal behavior, and then sets up a large set of rare-event smart trigger setups that target abnormal behavior. WaveScan permits search and scan of an acquired waveform for a non-monotonic event, any measurement parameter value, a runt pulse, or various serial data/bus patterns. The searchable event may be defined as greater than, less than, in a range, outside a range, etc. or rarest N events. A table identifies the found events with select-to-zoom capability, and the found events can be displayed overlaid on the waveform, similar to what is provided in Jitter Overlay or as a histogram (similar to what is described in Histicon/Histogram). Additionally, Actions can be set up based on found events. History Mode allows you to review any acquisition saved in the oscilloscope's history buffer, which automatically stores all acquisition records until full. Not only can individual acquisitions be restored to the grid, you can "scroll" backward and forward through the history at varying speeds to capture individual details or changes in the waveforms over time. Each record is indexed and time-stamped, and you can choose to view the absolute time of acquisition or the time relative to when you entered History Mode. In the latter case, the last acquisition is time zero, and all others are stamped with a negative time. The maximum number of records stored depends on your acquisition settings and the size of the oscilloscope memory. Encoding schemes organize serial data bits into symbols that are then assigned deeper meaning, e.g. 8b/10b encoding utilizes a defined sequence of 10 bits to define a K28.5 symbol. Teledyne LeCroy offers serial data decoders that decode 8b/10b and 64b/66b into Symbols and provide transparent color overlays and a protocol table with the decoded symbol information. This can be combined with a serial-data trigger to enhance debug and validation. Serial data protocols organize serial data symbols and bits into messages that follow a standard structure. Teledyne LeCroy offers more than 20 different protocol-layer serial data decoders for a variety of low-speed (I2C, I2S, SPI, UART, RS-232, CAN, LIN, FlexRay, SENT, ARINC429, MIL-1553, Manchester, and more), medium-speed (USB2, USB2-HSIC, 10/100 Base-T Ethernet) and high-speed (SATA, SAS, FibreChannel, PCIe, MPHY, DPHY, UniPro, DigRF3G, DigRFv4, and more). Many of the decoders provide unparalleled setup flexibility: for example, the SPI decoder permits decoding of simplified SPI without chip-select signals; I2S decode supports left and right-justified, EIA, and TDM; UART-RS232 can be configured in a Message Frame format to accommodate proprietary user protocols based on UART bytes, and so on. Serial decoders are commonly combined with a serial-data trigger to enhance debug and validation. Application Layer serial decode uses the previously obtained protocol-layer decode combined with an application-layer database to translate the protocol messages into commands and information more recognizable to a user. Teledyne LeCroy supports this level of serial decode for Controlled Area Network (CAN) using a user-provided DBC (.dbc file extension) application-layer database file. This capability is also commonly known as Symbolic decode for CAN (not to be confused with various symbol encoding schemes used with high-speed serial data). Serial decoders are commonly combined with a serial-data trigger to enhance debug and validation, and the serial data standards that support application-layer serial decode have application-layer trigger setup. ProtoSync allows users to acquire the physical-layer protocol signal, using a supported Teledyne LeCroy oscilloscope, and link the acquired waveform(s) with the (CATC) protocol decode and vice versa. This simplifies debug by combining the physical-layer view familiar to hardware engineers with the protocol-layer view a software engineer expects. If, for example, the user finds a protocol error, they can link directly to the oscilloscope waveform and discover that the protocol error was caused by a non-monotonic edge, slow rise time, runt, glitch, or other. By linking the two views, protocol- and physical-layer issues can be co-identified on the same trace. 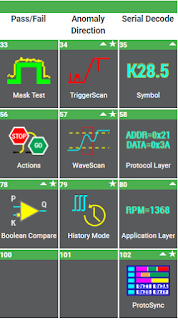 ProtoSync augments the symbol and protocol-layer serial decodes performed within the oscilloscope software and the protocol table display of these decodes. The next installment in this series will continue our survey of the Analysis portion of the Periodic Table of Oscilloscope Tools.